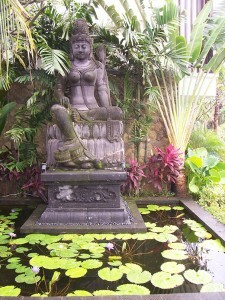 I recently traveled to Bali, Indonesia, and had a really easy time following a healthy, low carb diet and generally leading my usual healthy lifestyle. A lot of my clients have a lot of trouble eating healthy and exercising when they go on vacation so I wanted to write this post to inspire people, and to share what Bali is like for people who haven’t been there. 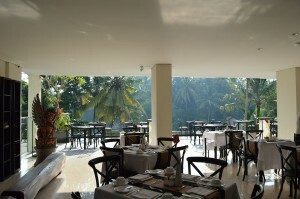 Here are some pictures from the hotel where I stayed. It was an extremely long flight. It was 12 hours from San Francisco to Taiwan. We had a 4 hour stop over and then it was another 5 hours from Taiwan to Bali. We slept for 14 hours when we got there and spent our days going to yoga, getting massages, eating healthy food, swimming and laying in the sun. A statue at our hotel. Organic, healthy food was very easy to find. There were plenty of paleo, organic, vegetarian and vegan options everywhere we went. Every morning we had eggs, tropical fruit and tropical smoothies. The hotel where we stayed. Susanne and David having breakfast. 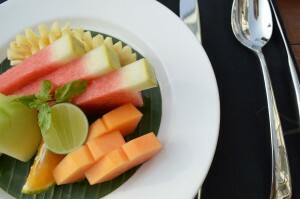 The fresh fruit we had every morning for breakfast. 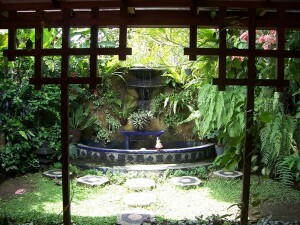 We stayed in Ubud which is in the center of the island and is very green and filled with rice paddies. 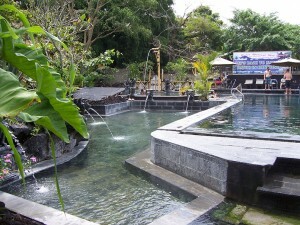 It is known as the cultural, spiritual and healing center of Bali. 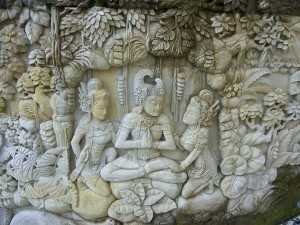 I was in Bali because my boyfriend was speaking at the Bali Spirit Festival. 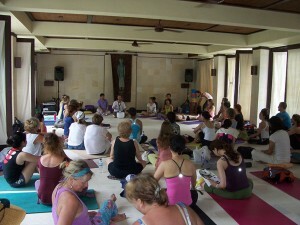 This festival had all kinds of great workshops, yoga classes, music and healthy food. Every morning the Balinese people put out these beautiful rice paper baskets outside of their doors, filled with flowers, rice and incense, and sprinkle them with water, as an offering to the Gods. It was very beautiful and everywhere you went, you could smell the scent of incense wafting through the air. 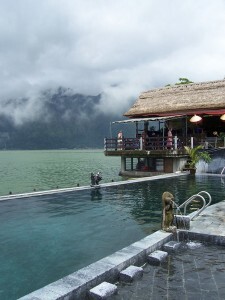 It was in the high 90s everyday in Bali, but one day it rained and was a bit cooler so we went to this amazing hot spring place that was at the base of a volcano, near Batur Lake and then had lunch overlooking the volcano. We got massages at this amazing place almost everyday. One day we got these incredible 90 minute massages with a body scrub, mask and milk bath, all for about 1/10 of what we would pay in the US. Here are some pictures. 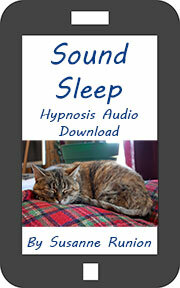 My Boyfriend, David, taught an amazing workshop on how to use sound healing for challenges and conflicts. We also went to the Sacred Monkey Forest, shopping, and then a concert in the evening. 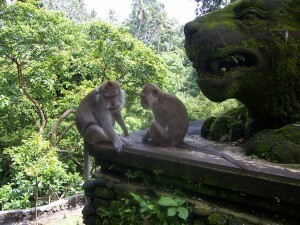 The Monkey Forest which is considered a Sacred Site in Bali. 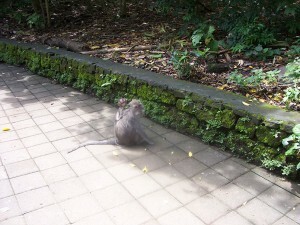 The monkeys were friendly and at times a bit aggressive. Some of them were tricksters. One of them stole my hat and I had a hard time talking him into giving it back to me. 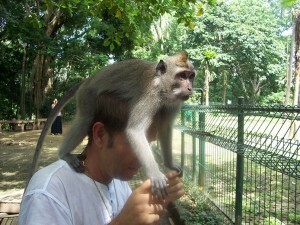 As you’ll see in the pictures, my boyfriend was very popular with the monkeys. There is a beautiful temple in the forest but unfortunately there are strict rules about what you can wear in the temple and David and I got kicked out for wearing sleeveless shirts and not wearing sarongs. 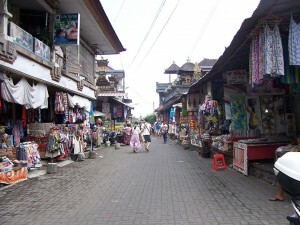 After that, we went shopping in the Ubud Market and bought all kinds of beautiful fabrics, bags and clothes for very little USDs. There is a big problem in Bali with stray dogs and even dogs that are pets are extremely unfriendly and seem very unhappy. We were shocked at how unhappy dogs in Bali seem. It is strange because even though there is extreme poverty here, the Balinese people are unbelievably friendly, positive and upbeat, and seem very happy, but the dogs are not. It was kind of heart breaking. I stopped into an animal shelter and talked them about it and donated some money to them so I at least felt good that I did something to help. Also, there are hardly any cats in Bali, people don’t have them as pets and there are very few strays. The festival was for four days, David taught 3 workshops, and we went to some workshops, had amazing healthy food everyday. 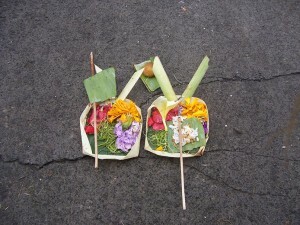 We went to the Ulu Watu temple in Southern Bali. It is a beautiful temple, perched on the side of a cliff overlooking the sea, and is considered a sacred site. There are incredible views of the ocean, a lot of monkeys living in the nearby forest and there were a ton of amazing butterflies and dragon flies, so many that it was like a butterfly sanctuary. We walked around the grounds and sat and meditated. It is a truly magical place. 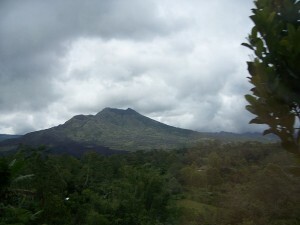 My camera unfortunately went dead and the Indonesian batteries I bought in two different stores didn’t work, so I will just link to some pictures, you can check them out here, http://tinyurl.com/kkrm84n. The stars were against me on this day because my cell phone went dead and David’s iphone camera also stopped working. That same day we went to Padang Padang beach in Kuta which is in the Southern part of Bali. This is one of the beaches that Elizabeth Gilbert went to in Eat, Pray, Love. If you haven’t read this book, you should check it out, http://amzn.to/1nZDHJ7. If you don’t know the story, its about an American women who goes through a terrible divorce and spend 4 months in Italy to experience pleasure, 4 months in India to experience spiritual devotion and 4 months in Bali to find balance. 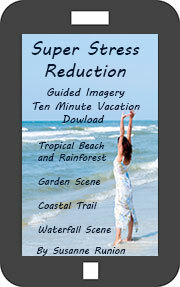 Again, I couldn’t take pictures, but you can check some out here in this link, http://tinyurl.com/k5g5nh6. This beach was amazing, it was completely calm and placid and would have been great for snorkeling. The water was very warm and crystal clear blue-green. There were these amazing caves that you could swim into. The crowd was local people and Europeans mainly. 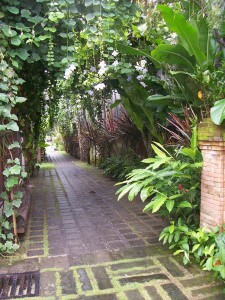 It was really strange because we mainly stayed in Ubud. We met many Americans who are now living in Ubud and many people from the Festival who travel to Bali every year, but when we asked people what beaches we should go to, hardly anyone could tell us. Most of them said that they never go the beach, they only stay in Ubud. Well, I have to say that all of them are missing out because the beaches are totally great. 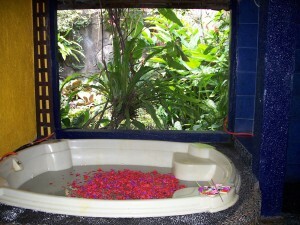 If I come back here, I would stay for a week in Ubud and a week at the beach. After the beach, we went to this incredible restaurant right on the beach called Baliku Cafe, again, I couldn’t take pictures, but you can check out this link to see what it was like, http://tinyurl.com/l5xloot. We had the most incredible meal, we had lobster, crab, clams, corn soup, some kind of Indonesian vegetable, along with wine and some very strong Pina Coladas. I am so sorry I could take any pictures because this lobster we had was completely enormous, I never saw anything like it. It can get very confusing converting dollars to ruppies, and this place had you pay for your seafood by the gram, and we also had a hard time converting grams to ounces, and even though the Balinese people speak English, most don’t speak it well. Well, as a result of all of the confusion, we ended up paying $80 for what we thought was an $8 lobster, making our bill $135 USD instead of $50 or $60 like we expected! We were okay with it though because it was a huge amount of food and the best meal we had in Bali and in the past few months. So if you travel here, you just have to be careful of the money conversions. Food typicaly is very inexpensive here and usually meals cost a tiny fraction of this so don’t let this scare you. We also went into a Health Food Store to buy some Epsom salts and were planning on getting two little 8 ounce bags to take baths. My Nutrition mentor where I am studying said that we should bathe in epsom salt and baking soda as it would get rid of all of the EMFs from the air travel. We thought these salts were $2.50 USD each, but when we went to pay for them, they were actually $25.00 USD each! So we put them back. 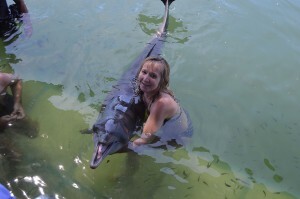 On our last day, we took a boat to an ocean pool where we got to swim with and interact with dolphins and sting rays. This was totally amazing. They were really friendly and seemed to really like people. 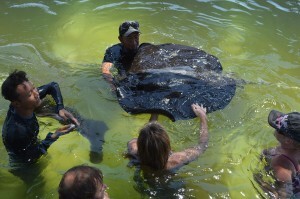 We spent about 45 minutes with the dolphin and 15 mins with the stingrays. We were told that these dolphins are here because they were hurt. 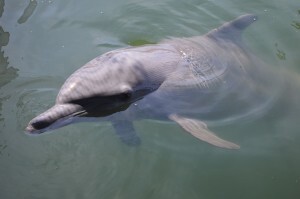 The dolphin that we interacted with, Nemo, was caught in a fisherman’s net and was badly hurt, but they said she along with one or two others, will be released back into the wild when they are ready. They seemed very well taken care of and our trainer said that they do release them into the ocean a couple of times a week for exercise and they always return. If you ever have a chance to do this, I highly recommend it. Also, several local people told me that the beaches on North Bali have this black sand that is magnetic and it has strong healing powers. They said that if someone has an injury or is in a car accident that they go here and bury themselves in the sand and they quickly get better. Definitely something I will check out on the next trip. The flight back was very long, 5 hours from Bali to Taiwan, a two hour stop over, and then 10 hours from Taiwan to San Francisco. If you ever have a chance to go to this amazing place, you definitely should. The was the longest flight I had ever took. I was not expecting to be hit so hard with jet lag. It took me 8 days to recover. I have since done a lot of research on jet lag and wrote a post about how to prevent it and recover quicker so other people don’t have to suffer like I did. You can check it out here.